How is it possible that the “occupy movement”, coming on the heels of the brazen theft of the bankster bailouts, never even articulated a specific political or economic agenda? How did it come to function as nothing more than a pressure valve to divert mass public outrage into a blind alley? If they’d made some well supported and commonsensical demands like a 1% sales tax on wall street turnover and the nationalization of the “federal” reserve this country could have turned around on a dime. They might as well have been working for the banksters. But maybe they were, without their knowledge. The propagandists and psychological operations specialists in washington are professionals at manipulating social movements or impending revolutions to achieve a desired outcome. They’ve been doing it very successfully for decades. Occupy was an abject failure even on its own terms, and its “tactics” (or lack of same), organizers and the corporate foundations that supported them behind the scenes should be exposed and shunned by any future movements. 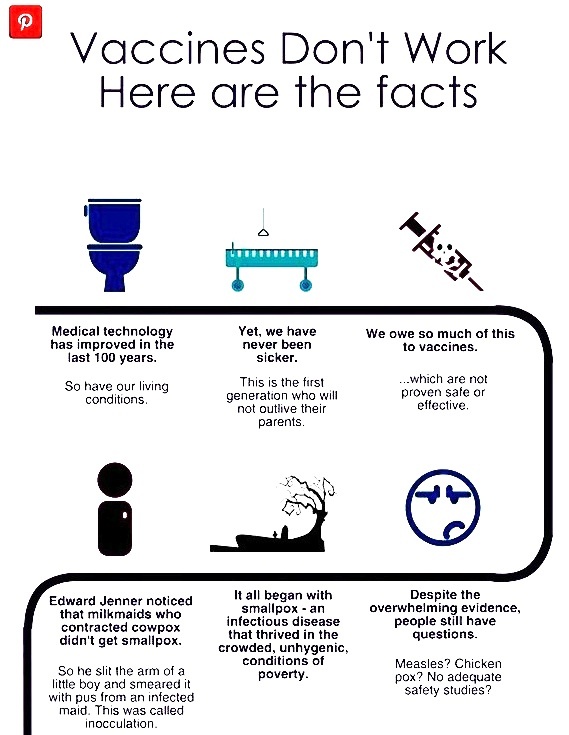 This infographic claimed that we live disease-free lives and owe this to vaccines – a great medical advancement. It gave a one-sided history of the creation of the first vaccine, an inaccurate account of the smallpox campaign, hailed the ineffective flu shot, misinterpreted the Lancet study, smeared Wakefield, blamed Jenny McCarthy for the “anti-vaccine movement” that has been around since the 1800s, attributed autism to anything but vaccines, dishonestly claimed that neurotoxins and hazardous wastes are safe, and said we shouldn’t have a choice whether or not to vaccinate, because we disrupt the herd immunity that doesn’t apply to vaccines. I know. I needed a glass of wine after I read it too. I certainly hope that no one rushed out and injected their kids without doing a little fact-checking. I hope that nobody used that infographic as a “weapon” against those who don’t vaccinate without doing a little research because that’s just not cool (or smart). Despite what you may have been led to believe, you are perfectly capable of using your brain and asking questions, no special credentials required. If you are going to vaccinate your child, you deserve the facts. See the entire graph at Health Freedom Alliance – Vaccines Don’t Work. Here Are The Facts..